To aid weight loss, wrap your body in seaweed and have a sauna. Then drink a plankton smoothie and practise fainting. Ballet moves can help tone muscle and improve grace and posture. Run around, leap into the air occasionally and repeatedly hurl yourself sobbing to the ground, claiming to be a giant swan. What do you mean, ‘Does my bum look fat in these pants?’? Don’t you mean, ‘Are these pants badly designed by some ego-frenzied rip-off merchant who skimps on fabric and couldn’t even cut a sandwich properly?’? From a book called “Lost in Translation, Misadventures in English Abroad” by Charlie Croker. In the section “Eating your words”. As suggested by a friend, I have to make a clarification of the word “prunes” I used in my blood plum cake recipe. It doesn’t refer to prunes as in dried plums but in a type of plum called prune plum. They are around now, have a short season but have a great taste when baked in cakes or tarts. In France, we call them “quetsches”. I thought it was time for something sweet. And the season for blood plums has started. Preheat the oven to 180C. Lightly grease a 24cm springform cake tin and line the base with baking paper. In the bowl of an electric mixer, cream together the butter and sugar. Add the eggs, one at a time, until light and creamy. Add the flour, baking powder and ground almonds and mix on low speed until just combined. Spoon the cake batter into the prepared tin. Arrange the plums, cut side down in a circle, starting around the edge and working towards the centre – push each plum about halfway into the batter. Sprinkle the cake with the sugar and flaked almonds, and bake for 1 hour, or until a skewer inserted into the centre of the cake comes out clean. Leave the cake to cool in the tin for 10 minutes before turning out onto a wire rack to cool completely. Cut into slices and serve. I cooked the cake in a round glass dish, instead of a springform tin ( I always found those not practical and had a few “leaking” accidents in the past). Keep an eye on it towards the end of the cooking time, it browned quite quickly. I used prunes instead of blood plums because there were in the fridge ready to be used. But next time I will use blood plums, the colour will be more striking. 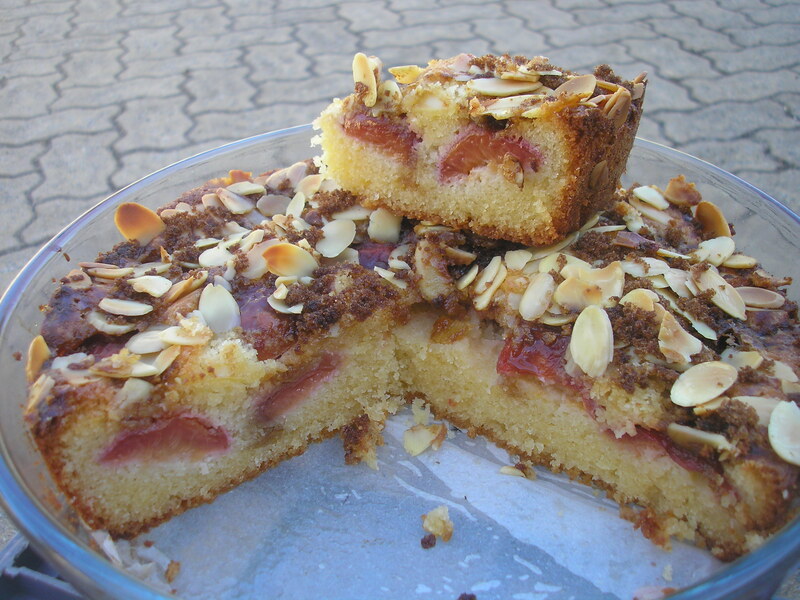 And I will add chopped plum pieces into the cake as well. And maybe a dash of vanilla essence. Very moist, even the day after. What about my uncle Harry who thought he was a banana? What was wrong with him: he had a split personality. And my auntie Maud became a lemon: she had lost all her zest for life. It has been a bit of a red week: red toaster, red wheels and red chutney. 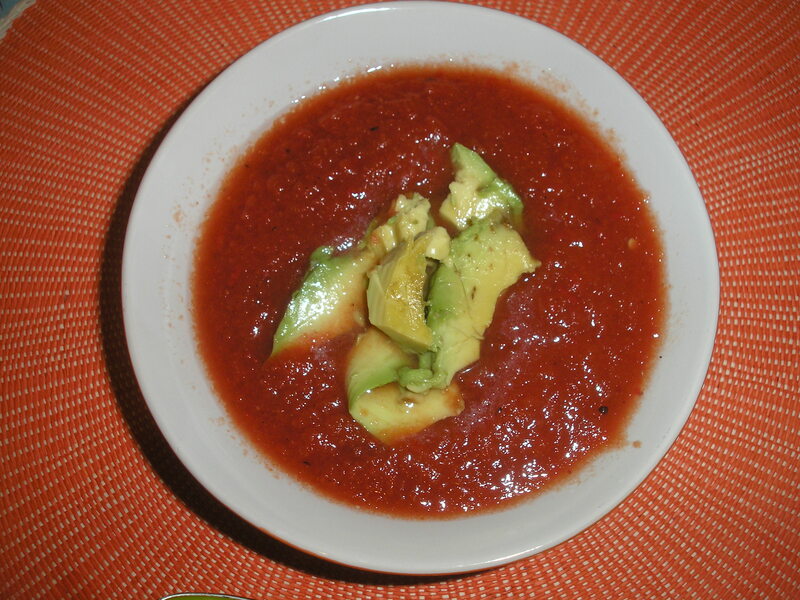 It has also been a bit hot, so this week’s recipe is red, cool and requires no cooking! (from The Australia Women’s Weekly Christmas Classics-told you it was a red week!). You will need a blender for this and I’m giving you the ingredients to serve 4 (because the whole amount doesn’t fit in the blender, too much- unless you have a giant blender…). So, blend 1 1/2 cup of tomato juice (375ml), 4 tomatoes chopped coarsely, 1/2 red onion chopped coarsely, 1 clove garlic crushed, 1 small Lebanese cucumber peeled and chopped, 75g of char-grilled red capsicum in strips and some Tabasco to your liking until pureed. You can add some avocado when serving (like I did) or if you have the time a dollop of guacamole or as the recipe suggests, some grilled prosciutto and a bit of coriander. School starts again today for students and teachers. So here are a couple of gems taken from “F in exams” by Richard Benson. The Pyramids are a large mountain range which splits France and Spain. Claire was well prepared for her interview. Explain how Claire may have prepared herself for the interview. Had a bath and put on her lucky pants.